Record labels often reissue an album six months or a year after the original release date, adding new songs, videos and artwork and beefing up the packaging. Some fans feel cheated, forced into buying the same album twice to get the extra odds and sods. With remix albums, such as KMFDM's 'Krieg,' the remix companion album to 2009's 'Blitz,' songs are completely deconstructed and re-worked, so it's almost like getting an entirely new product. 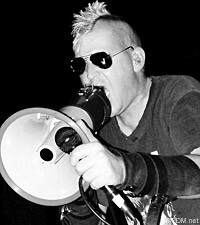 "A remix album is what it is," KMFDM vocalist Sascha Konietzko told Noisecreep. "I am not one, unless I am a huge fan of the band, to buy a remix album. But for the fans, as with everything we do, it is neat. And we do it for the fans. Nobody says that they wish that a certain person would do a remix, but when they hear a remix, they realize it is a good match." Konietzko says KMFDM's remix albums are a product of fan demand! The fans want, want, want. So he is happy to oblige and satiate them. "I am in the position, where I am putting out a lot of stuff and working hard, so our fans always want new stuff," he said. "I cannot record quality albums as fast they want new stuff, so a remix album does tide them over. The remix album is perfect. We do everything ourselves and we are in the position to offer them for low prices, so it's good for their wallets and that is appreciated."